James Taylor joined the Army from San Francisco, California in 1956. He is a “Mustang” having served his first 10 years as an enlisted soldier attaining the rank of Staff Sergeant before he was commissioned as an Army officer in 1965. By November 8, 1967, he was serving his country as a First Lieutenant in Troop B, 1st Squadron, 1st Armored Cavalry Regiment, Americal Division in Vietnam. When his commander was wounded in action, Taylor was ordered into the combat zone to take command and prepare a search-and-destroy mission. 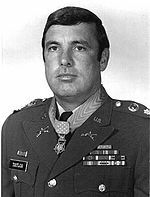 During a battle the next day, west of Que Son in the Republic of Vietnam, Taylor repeatedly exposed himself to enemy fire to rescue crewmen from damaged assault vehicles and personnel carriers. 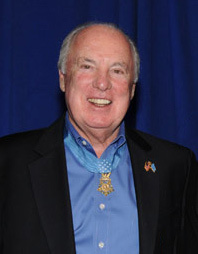 He was subsequently promoted to Captain and awarded the Medal of Honor on November 19, 1968. To form a bond of friendship and comradeship among all holders of the Congressional Medal of Honor. To protect, uphold and preserve the dignity and honor of the medal at all times and on all occasions. To protect the name of the medal and individual recipients of the Medal from exploitation. To provide appropriate aid to all recipients of the medal, their widows or their children. To serve our country in peace as we did in war. To inspire and stimulate our youth to become worthy citizens of our country. To foster and perpetuate Americanism.